Unleash the power of your sprays! Ideal for use when hard water is a problem. Helps to control fleabane in fallow sprays. Can be used with fallow sprays, or in-crop. Hard water has long been a problem with the effectiveness of many chemical actives and product formulations. 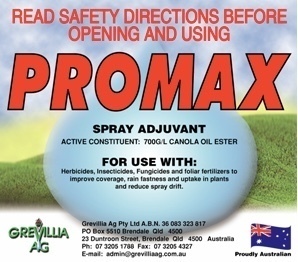 PROMAX will enhance the effectiveness of certain herbicides, insecticides, fungicides, defoliants and foliar fertilisers when used as directed. 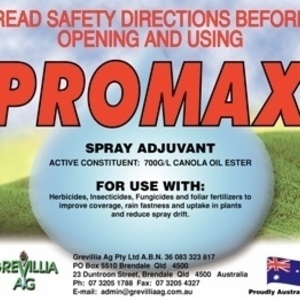 PROMAX is an advanced blend of esterfield canola oil and a package of premium non-ionic surfactants especially designed for use in hard water to reduce antagonism with chemical actives. This advanced formula formula enables PROMAX to assist with control of hard to control weeds such as Fleabane. PROMAX has proven ideal for mixing with glyphosate 450 for use in fallow weed control. Grower experience supports this use pattern. Recent trial work has also shown that Promax mixed with glyphosate herbicide will help to provide the best sorghum sprayout and dry-down prior to harvest. See the technote below.